We understand replacing your roof may make you feel uneasy with so many things to consider. We are a Licensed Roofing Contractor. We will help you decide which shingle is right for you. Backed by the best Warranties available. 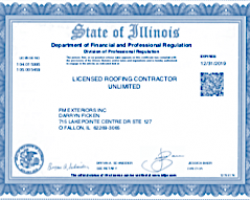 The State of Illinois does require roofer to have a state license. This license includes that the roofer be insured and bonded. The right roofing shingles will enhance your home’s appearance while providing you with the best combination of cost and longevity. Careful consideration of shingle we will assist you with shingle Type, Style, Color and design. 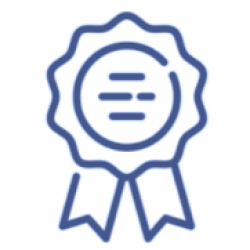 We always help you submit your manufacture warranty and provide a five year workmanship warranty compared to 1-2 years as a standard in the industry. Step 1: We will come to your home, discuss with you your needs and concerns and inspect your roofs current condition. Step 3: We will provide a written estimate and a detailed plan to replace your roof with peace of mind. Your roof may have suffered permanent and irreversible damage from hail or wind. As your Illinois and St Louis roofing and storm damage repair specialists, we know how to make sure your home is properly repaired and fully covered by your insurance company. Protect your investment by having your roof inspected today.